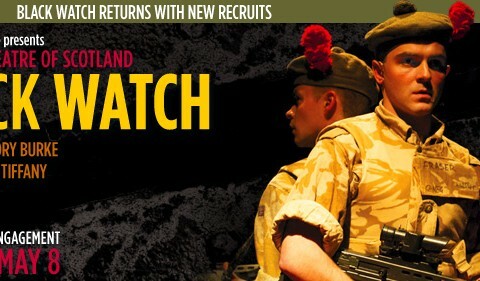 Written by Gregory Burke and directed by John Tiffany, Black Watch is a Scottish Army regiment’s eye-view of the war in Iraq. The play is based on interviews Burke conducted with soldiers who served, and hurtles from a pool hall in Fife to an armored wagon near Fallujah. Black Watch was the first piece of theater about the war to tell the story from the point of view of the soldiers, which it does via docudrama, video sequences, song, dance, panoramic historical sequences, an extraordinary sound score and in-the-moment acting. The ensemble cast members move in synchronicity with drill-time precision. Each and every one of them is a distinctive blend of fears, ambitions and confusion. It is important to remember the soldiers just as our troops are returning home in July, and Black Watchpaints their emotional landscape with deep empathy. The youthfulness of the new recruits, like the real soldiers the actors are portraying, lends a heart breaking, fresh realism to the show, which, six years after its premiere in Edinburgh, has become a modern classic.